Screenium 3.2.0 – Advanced screen-capture utility. 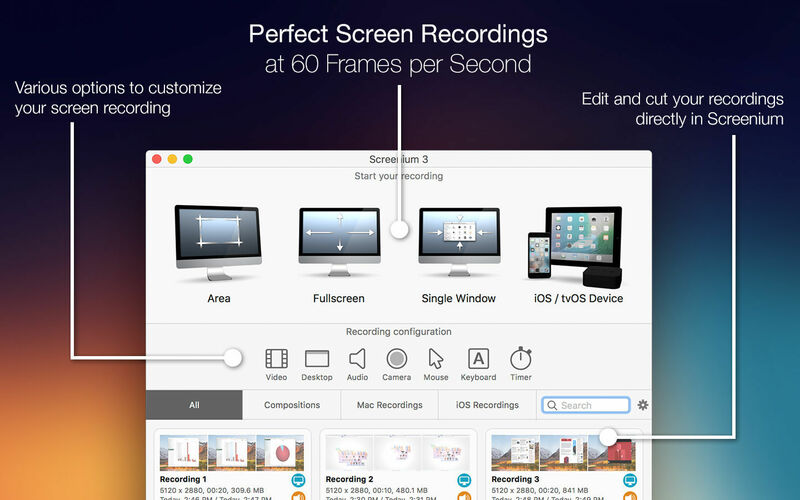 Screenium is a screen capture utility that allows users to create live movies of a Mac’s display, capturing the desktop, applications, mouse movements, and voiceover audio in high-quality, real-time screencasts. Capture system audio, now easier than ever. The performance of Screenium has been improved significantly. Capture 5K displays at up to 60 frames per second. Save valuable disk space by setting a scaling factor for recordings. Using a scaling factor of 50% will reduce the required amount of disk space by up to 75%. Mark audio tracks as master or slave. The volume of all slave tracks will be reduced when the master track plays audio. When the master track is silent the slave tracks' volume is restored. Next story DVDFab 10.2.1.3 – Complete solution for ripping and converting DVD and Blu-ray discs. Previous story Resume & CV Lab 1.2.2 – Collection of resume template designs. iShowU Studio 2.1.3 – Screen capture with full post-recording editing. Screenflick 2.7.7 – Capture screen movement to video. iShowU Studio 2.0.2 – Screen capture with full post-recording editing.